SAN FRANCISCO--(BUSINESS WIRE)--Jun. 2, 2016-- Visa Inc. (NYSE:V), the exclusive payment provider at the Olympic and Paralympic Games, today introduced a new innovation for use at the Rio 2016 Games – the first payment wearable ring backed by a Visa account. The Visa payment ring will be given to all Team Visa athletes in Rio, a group of 45 Olympic hopefuls from around the world who embody Visa’s values of acceptance, partnership and innovation. The Visa payment ring is NFC-enabled, allowing Team Visa athletes to make purchases by simply tapping their ring at any NFC-capable payment terminal. Key features of the ring make this a unique payment experience. The ring uses the patented NFC Ring® design of McLear & Co. that includes a secure microchip made by Gemalto, with an embedded NFC-enabled antenna, enabling contactless payment capabilities. Unlike many other payment wearables, the ring does not require use of a battery or recharging. It is also water resistant to a depth of 50 meters, meaning Team Visa athlete and Olympic gold medalist Missy Franklin can go from the pool to payment all with the tap of her ring. In addition, at an event in New York City today, Visa demonstrated an advanced prototype version of the Visa payment ring, which uses token technology provided through Visa Token Service, making it the first tokenized payment ring. Visa’s token technology replaces sensitive payment information, such as the 16-digit account number, with a unique digital identifier that can be used to process payments without exposing actual account details. Athletes and fans will also be able to use their Visa accounts leading up to, and at the Rio Games, using various new form factors. From booking and planning their trip using Visa Checkout or making purchases at the games on their mobile phone, both experiences are first-time offerings for Rio 2016, enabling athletes and fans to swipe, tap, dip or click to pay during their Olympic experience. As the exclusive payment provider of the Olympic Games, Visa is creating and managing the entire payment system infrastructure and network throughout all venues including stadiums, press centers, point-of-sale (POS), the Olympic Village and Olympic Superstores. 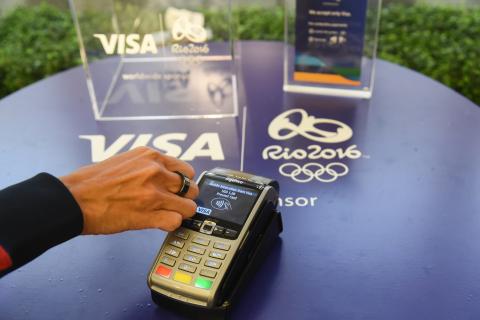 In Rio, Visa will implement approximately 4,000 NFC-enabled POS terminals capable of accepting mobile and wearable payments across key Olympic venues, the US Olympic Committee’s USA House and Copacabana Megastore. As the payments industry increasingly shifts from plastic to digital, new technology advances from Visa and its partners are bringing consumers a simple and more secure purchasing experience.